Four Rooms • Reflecting Pond • Horses Welcome! 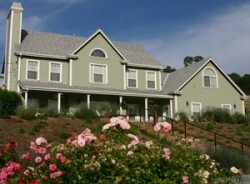 This Gold Country inn offers guests a relaxing venue on the grounds of an elegant American Country Inn specializing in growing lavender, grapes & olives. The inn has four well appointed bedrooms; an elegant dining room; cozy "gathering room"; tranquil reflecting pond; vineyard; olive orchard and grapevine covered arbor. Authentic European antiques are featured throughout. HORSES....Bring your owners! Unique to this Bed & Breakfast Inn is that equestrians can bring their horses with them in order to enjoy the hundreds of miles of magnificent trails in the area. Enchanted April B&B also partners with a local horse rescue so there are always a variety of horses recently saved from death, often including babies, to delight guests. The main house has four guestrooms, all individually decorated and designed for double occupancy. The Soothing Waters and Grasslands rooms have queen-sized beds and private bathrooms. The Riversong and Meadowlark have full-sized beds and shared bathrooms. In the morning guests will be treated to a delicious breakfast, which can be enjoyed on the patio next to the reflecting pond. Nightly room rates range from $179- $289 plus the additional 10% El Dorado County Occupancy Tax. Soothing Waters is a large room with romantic fireplace and private marble bath with whirlpool tub and Queen sized bed. Grasslands overlooks a pristine hillside covered with native grasses and topped with a sea blue sky. Queen sized bed. Meadowlark with its pink and white florals overlooks the expansive pastures. Double (full-sized) bed. River Song with crisp blue & white fabrics & views of the pond and seasonal creek. Double (Full-sized) bed. The inn has a conference room which is perfect for smaller seminars, workshops, arts & crafts get-togethers and retreats. The conference room is available for daily rental to non-guests at $250 per day for up to 12 people. Rental to guests runs $25 per person per day. From Sacramento via El Dorado Hills: This is the easiest approach. Take Hwy 50 East toward El Dorado Hills (West of Placerville). Exit at the El Dorado Hills Exit. At the light, turn right following El Dorado Hills Road North. This road will turn into Salmon Falls Road. Continue following Salmon Falls Road until you come to Enchanted April Farm at 5950 Salmon Falls Road. It will be on your left just after you pass Equestrian Way. IMPORTANT: House numbers will go up and down along Salmon Falls Road as you pass through various towns so don't panic if you see that they do. Look for landmarks like "Equestrian Way" to locate the farm. From Sacramento via Placerville: If you want to take the scenic route from Highway 50, take Highway 49 exit in Placerville north towards Auburn in the direction of Cool and Coloma. You will pass through the heart of the Gold Rush Country including the historic town of Coloma where gold was first discovered. A few miles past Coloma, take a left on Rattlesnake Bar Road. Then veer left onto Salmon Falls Road. Enchanted April Farm will be several miles ahead on your right. From Interstate 80 via Auburn: Take the Highway 49 exit towards Placerville in Auburn (south-east). Enchanted April Farm is about 10 miles from Auburn. From Auburn, you’ll travel down into a deep canyon. Highway 49 turns right at the bridge. Go right across the bridge, following the signs to Cool. Continue on Highway 49 towards Placerville, passing Cool, until you see Rattlesnake Bar Road on your right. Make a right onto Rattlesnake Bar Road and then an immediate left onto Salmon Falls Road. Follow Salmon Falls Road for a few miles until you see 5950 on your right. IMPORTANT DIRECTIONS FOR HORSE TRAILERS: You can use Interstate 80 from Auburn, but the road is not as easily accessible for horse trailers. This windy and steep road has an 8% grade at times. So gear down when coming from the I- 80/Auburn direction. If you take Highway 49, when approaching Enchanted April Farm from the north on Salmon Falls Road, please do not turn right into the driveway when you arrive. For safety’s sake, please CONTINUE DOWN THE ROAD about 300 yards until you see a turn around at EQUESTRIAN WAY on your left. Once you turn around there you will have an easy and clear access into the farm's driveway. Once you get to Enchanted April Farm, access and turnaround at the farm is excellent, even for large rigs.